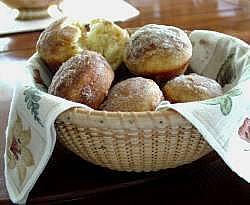 These "morning" or "breakfast" muffins are dipped in melted butter, and then dredged in cinnamon-sugar after they are baked. A lovely "sweet" to go along with your morning coffee or tea. 1. Preheat oven to 350 degrees F (180 C). With cooking spray or liquid vegetable oil, lightly grease a 12 cup muffin pan, or a 24 cup mini muffin pan. 2. In a mixing bowl combine flour, the 1/2 cup sugar, baking powder, nutmeg, and salt. Make a well in the center of the dry ingredients. 3. In another bowl beat egg slightly; stir in milk and 1/3 cup melted butter or margarine. Add egg mixture to flour mixture. Stir just until moistened (the batter may be lumpy). Fill prepared muffin cups about halfway full with batter. Bake in a 350 degree F (180 C) oven for 20 to 25 minutes or until muffins are golden. 4. Melt the 1/2 cup butter. In a shallow bowl combine the 1/2 cup sugar and the 1 tsp. cinnamon. Immediately dip tops of hot muffins into the 1/2 cup melted butter or margarine, then into the cinnamon-sugar mixture until coated. Muffins are best served warm. Store muffins at room temperature, covered. Makes 12 standard size muffins or 24 mini size muffins. *Note: If using a dark colored or non-stick muffin tin, bake muffins at 325 degrees F (160 C), instead of 350 degrees F (180 C). Make-ahead tip: Bake muffins as directed. Cool completely. Place muffins in freezer containers or bags and freeze for up to 1 month. To reheat, wrap frozen muffins in heavy foil. Heat in a 300 degree F (150 C) oven for 15 to 18 minutes. I loved this recipe but I liked to cook them in a loaf pan. Can this particular recipe be cooked in a loaf pan? My mom and I used to make muffins like these, but then we lost the recipe. Your recipe was exactly the same! Thank you, these bring back a lot of memories! Simply awesome. One of the only muffin recipes I can get my young children to eat! Hi Diana, am new to your website. Tried these muffins today and they were easy to make except you really need to oil your muffin trays as they tend to stick even on the bendable muffin holders. Dusted icing sugar on the top as an alternative to the suggested topping. The kids loved them!! Light fluffy and so tasty! Fast and easy to make. Thanks!! they are so good that for my home economics project on muffins i'm making them. I made the muffins and they were simply delicious!!! I made these for my husband and myself one Sunday morning and they turned out delicious!! They aren't too sugary tasting. I did do something different. I "accidentally" mixed the butter and sugar and cinnamon together in one bowl and I just dipped the muffins in that and they turned out really good. Thanks for the recipe!! I'm gonna email this to my mom. She's not much of a cook so she will love these, they are so easy. These were simple to make, but not great. Reminded me of the sugar/cinnamon toast my mom use to make. Great recipe, never in my life used it but it sounds great! Taste so good!!! Love them, and best when served warm.. Simple to make, not the greatest I've had. Probably won't make again. my friends tried my food and desserts. what i make they say is very good, so i think i am good but i am trying to make it excellent. They came out very yummy and I loved em! Except the topping was really unnecessary! I would love to learn another topping OR serve it without the topping.